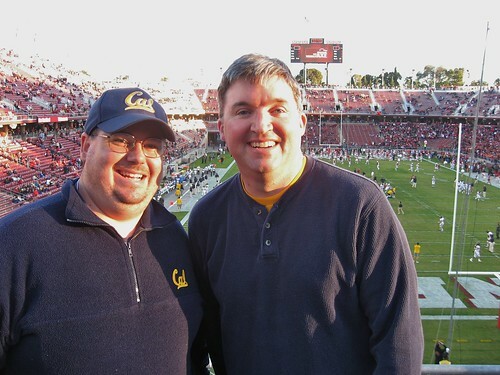 In this podcast: We still can’t believe Cal won the Big Game. We talk offense, defense, special teams, strange play-calling, and the general atmosphere in Stanford Stadium. There’s also a preview of the UW game, we talk bowl positioning, and there’s even a secret word. Happy Thanksgiving, everyone! I seem to be the only one out there who had a lot of confidence/hope when Stanford had 1st and 10 at the Cal 13. Those last yards are the hardest and the clock was down low enough that handing the ball to Toby 4-5 times in a row was not an option. That game was far from being a lock for Stanford at that moment. So, imagine that Mohammed wasn’t there. The receiver was well covered and it wouldn’t have been caught (in fact, if Luck had put some air under it like he said he should have, it might have been intercepted by Cattouse who was all over the receiver). In any case, let’s pretend that there was no interception. After the incompletion, it would have been 3rd and 10 from the 13. That’s two plays to get a touchdown (I’m ignoring the 1st down scenarios because it’s unlikely that close to get a 1st down but not a touchdown when going to the air or screen passes or the such.) and it’s even more difficult to figure out how to get Toby the ball in a way that works, because you’ve basically got two plays. Personally, I think the smart money at that moment is still on the Bears, particularly the way Luck was playing. Don’t get me wrong, I was glad that Mohammed put an end to it. I just don’t think it was as desperate as many suggest. I kept saying it in the car on the way home from the CalTrain station: I can’t believe we won that game. Oh, and before the game, your faithful correspondents met up. We only see each other at Stanford Stadium. I’m serious. It’s weird. Jason (that’s me) on the right, Ken on the left. At best, the QB decides to knock down the ball instead of catching the deflection. Then it’s 4th and 3 at the 25, setting up a 42 yard field goal. This kicker’s lifetime long is 37 and his one shot at a 40+ yard field goal was missed. Definitely not a gimme, but I also doubt Stoops goes for it on 4th and 3. I’d give the kicker a 1 in 3 shot at best at that field goal. More realistically, the QB catches the ball but decides not to throw again. Well, Cal was hot in pursuit and again, at best, he’d have made it to the 30 yard line before getting tackled. Now we’re talking about a 47 yard field goal or if Stoops thinks that’s too long 4th and 8. This, ironically, might have been the best thing to happen to Arizona as it would force their hand to go for it on 4th down but it wouldn’t have been 17 yards, only 8-10. So yeah, putting it back to 4th and 17 didn’t help Arizona’s cause, but I think it wasn’t as big a deal as some make it out to be. The instant that pass was blocked, Arizona was in a tough spot. Another week, another On The Road Home Podcast. Sorry for the sickly voice. It actually came out better than I hoped, but it’s still pretty bad. In this podcast, we’re re-capping the delightful victory over Arizona. Pre-capping a scary battle with the scariest Stanford team in recent memory. Talking Rose Bowl scenarios for almost everyone except Cal. (Of course.) We wonder why Cal can’t recruit a freakin’ kicker, praise the offensive line, unveil a new Secret Word (this week: it’s a concept! ), Jason does yet another round of terrible Bill Walton impressions, and goes off the deep end to discuss the strengths and weaknesses of recent James Bond movies. What does that have to do with Cal football? Oh, right–nothing at all. 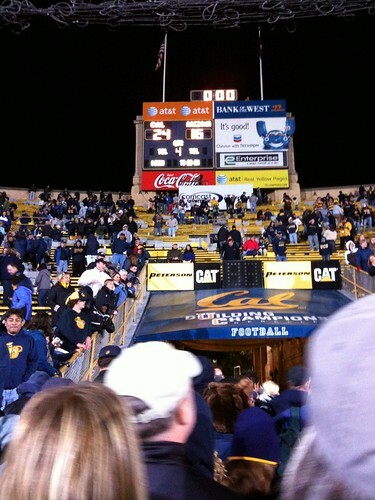 It sure felt good to leave Memorial Stadium for the last time in 2009 with a win. This week we recap the Oregon State game, specifically the scariest moment in recent Cal history. The future of Jahvid Best, the future of the Cal Bears, the difficult path ahead against Arizona and Stanford, and Stanford’s defeat of Oregon. Jason tries to improve on his awful Bill Walton impression. And yeah, there’s a secret word. Try to find it and work it into the comments to win a no-prize. That’s what went through my mind when I saw the announcement that the Big Game will be at 4:30 PM on Versus. This Versus against DirecTV feud just got really frustrating to me. Two weeks in a row of games that no matter how much I’m willing to pay DirecTV I can’t get on my TV. Yeah, I’m going to game. My kids have not missed a Big Game in their life and that’s not going to change as long as I can help it. But I like to have the game recorded at home for later review and for archiving to DVD (I know, I know, there are torrents available, but generally they’re not as well edited as mine). I guess it’s good we’ll get some national exposure in the beat-downs I fear we’re going to receive in the next two weeks… or is it? The On The Road Home podcast is up. I’m getting better, it’s only Wednesday morning. Since it was a home game, no interview quotes in this one, but as a bonus you do get to see the darker side of Ken in this one (remember that is really is recorded on the way home from the game, so no time to get one’s emotions in check). Where are my Stanford tickets? Just in case you were wondering. If you pre-ordered Stanford tickets and opted to have them electronically delivered “no less than two weeks before the game,” you may be confused by the fact that you haven’t received them yet. Have no fear, says Erin from the Athletic Ticket Office. They’ll be sent out by the end of the week. How exciting for us Bears fans to see the best college football team in the Bay Area play at Stanford Stadium! Posted on on November 9th, 2009 in Tickets | Comments Off on Where are my Stanford tickets? Versus picked up the Arizona game so the game will be at 4:00 PM. All healthy-hearted (you’d have to be after Saturday’s heart-wrenching loss [even without counting Best’s injury]) sturdy golden fans are welcome at the stadium. As an FYI, for those with DirecTV, Versus is no longer available. Well, it’s game day and I can’t quite make up my mind how scared I am of Oregon State. My co-worker who’s a relatively fair OSU alum thinks that Canfield is going to be a real problem for the Bears. He thinks the Bears are going to either have to stop the Rodger brothers at the line of scrimmage and risk getting burned by Canfield downfield, or keep everything in front of them and let the Rodgers brother nickle and time them to death with the occasional big play that’ll kill the Bears. In some sense I’m inclined to agree that if the Beavers win, that’s about what it’s going to come down to. At the same time, this has the makings of a Pac-10 shootout. There’s a reason that the over/under is at 61 (it averages in the low 50’s for most games). I like the Bears chances in a shootout. The Beavers might have the Rodgers brothers, but we’ve got a much bigger family of explosive players than OSU. At the same time, the Bear defense is more opportunistic than OSU’s and is more likely to come up with the big turnover. They’re also more likely to force a lot of redzone field-goals when things get more dicey for the passing game. The running game is more important in the redzone and the Bears have the edge in that. These edges, both for the Bears and the Beavers, become most obvious when you look at the statistical preview I did over at BearTerritory.net (subscription required). Finally, don’t think too much about the history of this match up. Yes, the Beavers are undefeated against Tedford in Berkeley and they’re on a 2 game winning streak, but the Bears were on a 3 game winning streak over the Ducks including a recent victory in Eugene and we saw how that worked out for the Bears. Does anyone really think that if Longshore was healthy against OSU in 2007 the Bears wouldn’t have won that game? They nearly won with a redshirt Freshman QB for who the game didn’t start slowing down until the 4th quarter. Add in that in 2005 the Bears were Booya handicapped and all of a sudden the Beavers winning streak in Berkeley makes a lot more sense and isn’t so intimidating. In each game in Berekely going back to 2003 the Bears have been breaking in a new QB for the OSU game (in 2003 it was Aaron Rodger’s 3rd start overall and he had sat most of the 2nd half of the USC game the preceding week) and the Beavers beat the Bears with press coverage and daring the Bears to beat them over the top. Going to the games in Corvallis, the Bears destroyed the Beavers in 2004 and 2006, so it’s not like the Beavers “have the Bear’s number”. The game last year was competitive and the Corvallis home field advantage was an important factor. 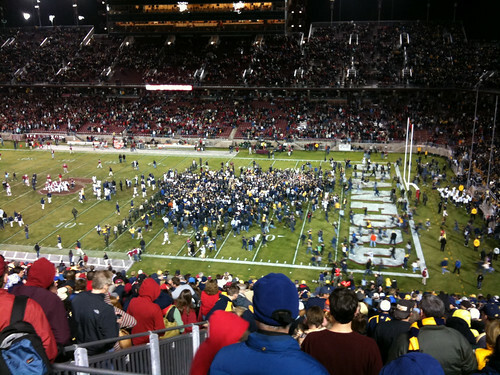 Based solely on last years game, I think if you play that same game in Berkeley, Cal likely wins. Add in that OSU has lost far more talent since then than the Bears and it’s not exactly like past history suggests a Beaver victory even though that’s the way it seems. The “Beaver struggles” are more like the difficulty Cal has had beating UCLA in the Rose Bowl. The sample size is small and there’s lots of extenuating circumstances. We all saw how that worked out this year in the Rose Bowl. In the end they actually play the game instead of just counting on history to determine the outcome. Most of the time, the better team wins despite what history may have to say. So, take heart. There’s no jinx here. The statistics suggest an even match up. The recent match ups and talent changes suggest Cal should do well. And finally, the game is in Berkeley where the Bears play very well. Another late OTRH podcast. I’ll tell you what, that road trip took A LOT out of me. I just didn’t have it in me to stay up late editing audio until last night. But the good news is that it was indeed recorded on the way home, right after my Griswaldish trip to the Grand Canyon. The good news is it is another long one.